San Diego offers entertainment activities and cultural sites for the entire family. FOR STAYS LESS OR MORE THAN A WEEK PLEASE CHECK DIRECTLY WITH OWNER. My name is Donna, I was raised in San Marino California and come from a warm and hard-working Italian/English/German family. My immigrant parents worked as educators, health practitioners, and law enforcement. I have spent my life as a middle school teacher of world civilizations and have nurtured thousands of students in the course of a busy lifetime. At one point in my life, it was time for me to find my Place of Peace, which I did. It is here, at my Beach Retreat, which I share with others so that, like myself, they may experience the soul-soothing qualities of life by the Ocean. There is something very special about being able to wake and doze to the distant sounds of the sea, be soothed by the fragrance of salt, and be invigorated by the brush of an ocean breeze as we gaze at myriad stars twinkling above. Everyone -- everyone -- told me that I could not afford this home on a teacher's salary, but I have made it a priority and invite you to join me in enjoying this special sliver of heaven. By staying here and becoming a trusted guest and client who will hopefully return year after year, together we can achieve this dream together: cultivating our souls by surrounding ourselves with peace, tranquility and beauty, so that we may bring peace to others. Did you know that 97% of our earth's water is in the Ocean and yet less than 1% of oceans are protected by law as ocean sanctuaries? Hopefully a stay here at the Beach Retreat will rekindle your love of nature and help you get all your priorities straight - like it has done for me - I hope you join us for special moments like writing a book, rekindling a marriage, having a wedding or family reunion, or enjoying a sports retreat full of yoga, ocean swimming and beach walking. California is a world capital of health and with our mild climate it is the perfect place to be and stay healthy in harmony with the planet! 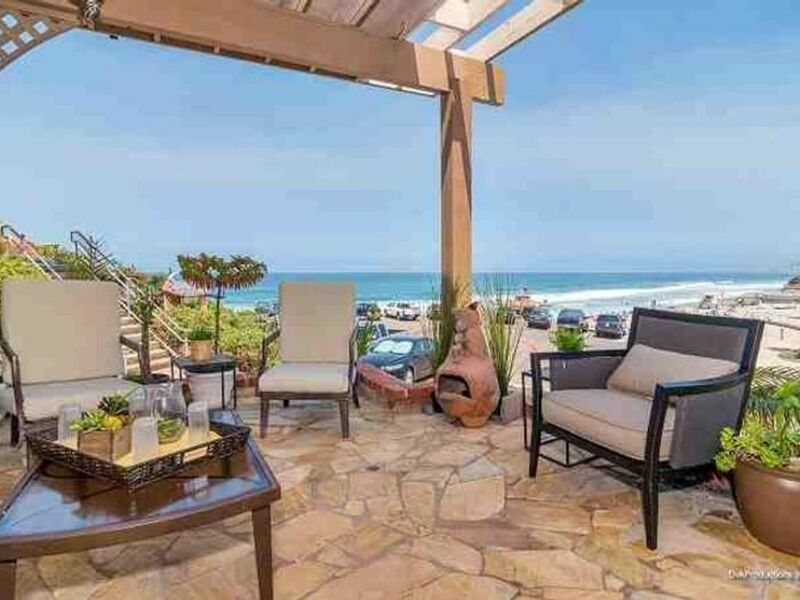 This estate is a unique one of a kind beachfront home directly on Moonlight Beach. This newly renovated beach has a lovely lookout, walkways, concession stand, fire pits, bathroom/showers and a landscape that would entice any beach goer. It is known for surfing, and the best swimming beach in North county. Our little corner of the world is a destination for those who want peace and tranquility. If you are a world traveller and stay here you will quickly notice that the Beach Retreat is unlike anywhere you have been before. This unique beach and oceanfront property is quiet - there are no sounds from loud streets, we do not hear trains, and it is possible to put your suit on and walk straight out to the beach. In the other direction, it is just a couple of blocks from a myriad of restaurants including Italian, Peruvian, Continental, American, Hamburgers, Ice Cream, cafés, boutiques, local museums, and more. If you have children, San Diego offers LegoLand (just a short drive away), San Diego Zoo, Sea World, SeaPort Village, Old Town, Birch Aquarium, La Jolla Cave and Children's Cove, local hiking trails and so much more. We have held many weddings at this property because of its proximity to the ocean and special Outlook promontory covered with grass for ceremonies above the sea. If you plan to bring together a larger group, both levels of this home (upper and lower) are available to rent - this Beach level below, as well as the luxury Upper level above. You will be comfortable surrounded by the bright counters in the kitchen and bathroom, a special marine style bathroom, an outdoor bbq, a huge walk-out patio for having dinner or gazing at the beach and ocean horizon depending on the time of day. The charms of this Beach Retreat are so many: at the end of the day relax in this beachfront environment as you leisurely dine, read or write a book, take in a movie or watch some TV. This relaxing space is all yours to call home for the time you are with us! This Beach Retreat is the perfect place for a healthy and spiritually fulfilling getaway. Leave your cares behind, unplug, rejuvenate and celebrate life on your own, with friends, or loved ones. Or, for the worker bee, stay plugged in and work from paradise from your computer as you gaze out towards the beach instead of a cubicle or office wall. With all the benefits of an island retreat including toes-in-the-sand therapy, excellent food, meals on the patio outdoors, and sunset soirées, the Beach Retreat is also only 30 mins from an international airport, walking distance from a train and coaster station. I fell in love with this property because I have spent my life in the fast lane professionally speaking and it was time to get back in touch with the me behind the round-the-clock educator me. By mixing so much beauty into a life that is still busy, I have achieved a certain amount of balance that was lacking in my life before. By sharing this property with others and making all our lives more abundant as a result, it nourishes my own spirit and I become a more complete person. I look forward to hopefully making a 100% electric vehicle available for your use in September 2015, it can be recharged just two blocks away, and is a no-emissions renewable clean energy vehicle that will be part of our making our world a more harmonious place when we all do our part to live in a sustainable manner by reducing waste and pollution. I will be honored to have you as my guest and hope you respect and protect my special property as much as I do. Once you are here, you will want to share it with your friends and family and I hope you do! I have had visitors from all four corners of the globe and many become return visitors, building a special relationship with this little slice of paradise where seagulls, sandpipers, and pelicans fly in unison above whales, dolphins, and sea lions. What a spectacular beach retreat and location! My family loved every minute of our stay and did not want to leave this incredible corner of the world. The beach is steps away and the view is stunning! Donna was such a gracious and accommodating host. We knew if we were in need of anything, Donna would take care of us. We hope to return very soon to the beautiful Beach Retreat. two different levels to house... fun views from both levels. What a perfect find for our Memorial Weekend getaway. Spent 3 wonderful nights in this very comfortable, clean, well kept beach spot. Amazing sunsets, quiet - locals beach of the beaten path in Encinitas. Away from the craziness of Mission Bay/Sea World/Downtown San Diego. Our hostess/Owner, Donna, was so attentive! Not that we were in need of anything in this well appointed slice of heaven! We will be back! What a lovely ER Doctor who wanted timeout with his family to enjoy the beach setting!! I almost don't want to tell how great it is as I want to keep this amazing house to myself. Donna was such a lovely hostess and so pleasant to work with. She rents now both her upstairs unit and downstairs out. I was in the downstairs with my husband, 6 year old son and dog. It was perfect. It was very clean and had everything we needed. We basically lived on the front patio and went back and forth to the beach several times a day. It was probably 30 seconds from the porch to the sand. We could watch my nephew and so play in the sand while we sat on the patio. Very close to the Main Street of restaurants and shops. We even walked 4 blocks to the train and took it to see a padres game. Everything was perfect. I truly can not wait to go back to this getaway! We had a wonderful stay at Donna's Beach Retreat. Beautiful views and sunset from the patio! Excellent customer service by Donna. We where five friends staying there and it was Perfect. Charming, Enchanting, Mesmerizing: a Memory Maker! This beach-front oasis has been redecorated since my last visit- beautiful! So convenient for this avid swimmer to be able to walk out the door in a bathing suit and use the Moonlight Beach showers to rinse off afterwards. Our rooms were cozy and elegantly decorated, all impeccably clean. Full kitchen and laundry facilities make this Beach Retreat very convenient. Discreet owner was very warm and welcoming. Highly recommended for any discerning traveller. Restaurants like Quero and boutiques galore in nearby Encinitas, all walking distance from the beach.